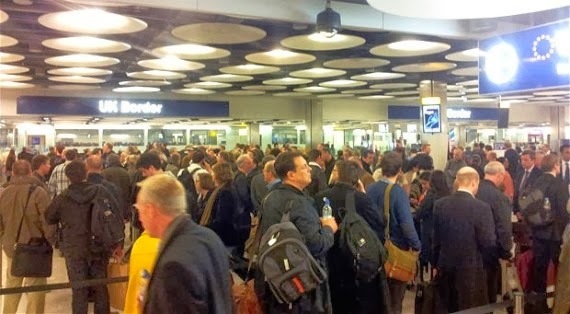 In 2012 in the run up to the Olympics, queues at Heathrow reached silly o’clock, with some passengers waiting over three hours to get through passport control. But thankfully, the UK Border Agency seems to have responded to the criticisms that it was too slow, and the queues have since subsided. You can still expect to wait around an hour upon arrival in the UK if you’re a non-EU resident. (There are two queues.) But there is a way you can get to the front of the queue without paying. If you’re touching down at one of the less busy times, you can really help your chances by departing the aircraft quickly. Often the queue at immigration consists of passengers from just one or two flights, so where you land in the queue is determined by how quickly you got off the plane. This doesn’t mean jumping out of your seat as soon as you hit the tarmac. But making sure your hand luggage is easily retrievable and being quick to get off the plane could save you time at the dreaded -- and very strict -- passport control.